"Overall, this is a most attractive, easy-to-read, practical handbook of regional anaesthesia... As an established practitioner of regional anaesthesia, I will refer to it frequently, and I may even be encouraged to attempt less commonly used techniques within my own practice, with this for bedside reference... A welcome addition to the regional anaesthesia literature!" 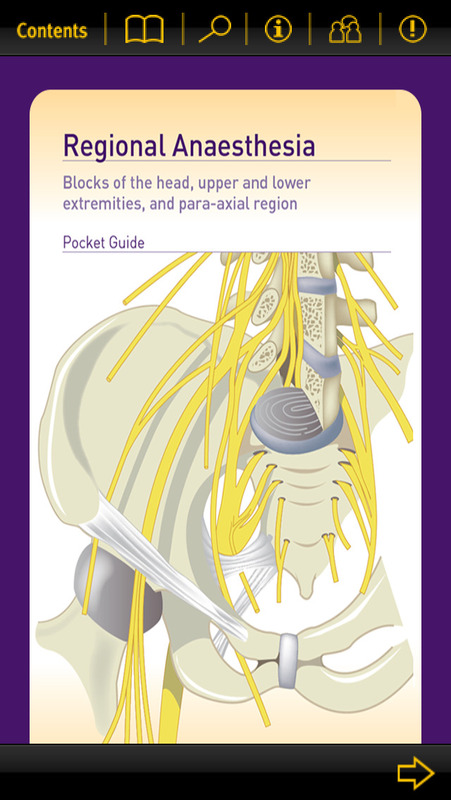 The Regional Anaesthesia Pocket Guide for iOS comprehensively describes all major and important peripheral and neuraxial blocks of the upper and lower limbs, head and neck, abdomen, and trunk. Special attention is given to ultrasound guided nerve blocks, with sections on scanning tips and clinical pearls on obtaining and optimising sonoanatomy and needle visibility. Suitable surface landmark approaches are discussed along with ultrasound guided techniques. These are included for practitioners without access to ultrasound guidance, as well as blocks where ultrasound guidance does not apply, such as blocks of the head. Other sections describe indications and contraindications to regional anaesthesia, informed consent, local anaesthesia systemic toxicity diagnosis and treatment, and preparation of nerve stimulators and ultrasound machines. We hope that the Regional Anaesthesia Pocket Guide for iOS will be an invaluable companion for trainees and residents as an educational tool, and for consultants and attendants as a handy resource to support your regional anaesthesia practice. Successful regional anaesthesia relies on two critical tasks: the identification of target nerves within their anatomical surroundings, and the application of local anaesthetic solution as close as possible to the target nerve. High-frequency ultrasound is assuming a more prominent role in anaesthesia practice and allows better visualisation of target nerves and regional individual anatomical variation. Real-time needle placement permits accurate deposition of local anaesthetic reducing the total volume and dose required, and the risk of inadvertent trauma to vulnerable structures. C & S Publishing Pty Ltd, Lismore, NSW, Australia. C & S Publishing make no representation, express or implied, that the drug dosages in this book and electronic application are correct. Readers must therefore always check the product information and clinical procedures with the most up-to-date published product information and data sheets provided by the manufacturers and the most recent codes of conduct and safety regulations. The authors and the publishers do not accept responsibility or legal liability for any errors in the text or for the misuse or misapplication of material in this work. Except where otherwise stated, drug dosages and recommendations are for the non-pregnant adult who is not breast-feeding. Nerve - Do You Dare? by Lions Gate Films Inc.